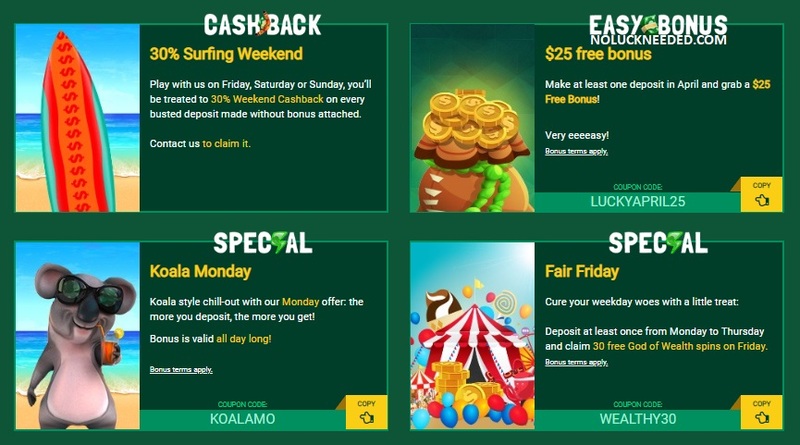 Spin the reels of the best online pokies this April with a $25 free chip from Fair Go Casino! Redeem the coupon code LUCKYAPRIL25 in the casino cashier to claim your $25 loyalty bonus freebie after you have completed a deposit this month, but do not claim two free bonuses in a row. You can also find a link to a list to all the April 2019 Fair Go free no deposit bonus codes listed below or keep an eye on the casino's message center for new promotions. Good luck! First deposit only! No Maximum Cashout! Free Spins Game: varies; AUD$20 Minimum Deposit. Bonus terms and wagering requirements apply, please check the casino's website for details. Ongoing offer for new players. Claim your April Free Chips and Bonuses at Fair Go Casino!